UP Elections 2017 Results Assembly / Vidhan Sabha: The election in the biggest state of India, Uttar Pradesh took place from February 11 to March 8, 2017, over a total of seven phases. It appears to be a kind of triangular contest. The current ruling party Samajwadi Party (SP) has entered into a seat-sharing alliance with the INC (Indian National Congress). Earlier, Sheila Dixit was its chief ministerial candidate. The first phase of polls kick off on Feb. 11, then the second phase of voting took place on February 15 while the following stages held on February 19, February 23, February 27, March 4, and March 8 respectively. March 11 has been reserved as the vote counting day along with four other states Punjab, Uttarakhand, Goa, and Manipur where elections held too. 11:07 am: Bharatiya Janata Party is leading with 299 seats out of 403, while SP-Congress 73; BSP 17; Others 9. The current party – Samajwadi Party (SP) came to power in 2012 under the leadership of Mulayam Singh Yadav. At that time, it had overthrown Mayawati’s Bahujan Samaj Party (BSP) with a clear majority as it won 224 seats out of 404. The son of Mulayam Singh, Akhilesh Yadav was made the Chief Minister. However, at this period, Akhilesh has made himself the party chief and has made an alliance with Congress. INC vice-president Rahul Gandhi and Akhilesh Yadav together have done many parts of the election campaign. They have been criticizing BJP since a long time now. 1. Goa Assembly Elections Results 2017. 2. Punjab Vidhan Sabha Election 2017 Results. In this election, Mayawati came up with a good number of Muslims and Dalits candidates. She also tried to take advantage of the present SP inside-feud to work to her advantage. 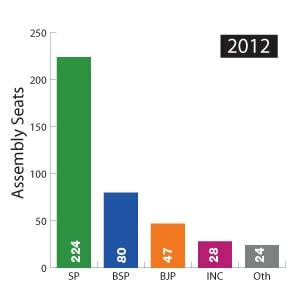 In the last elections (2012), BSP won only 80 seats and settled down as the second largest party in the state. After SP and BSP, there comes BJP (Bharatiya Janata Party) who stood at number three. BJP is relying on two factors – forming government at the center and Prime Minister Narendra Modi. In 2012, it won only 47 seats against 404. However, PM Modi is campaigning for the party and making a hell lot of difference this time. He has held a number of rallies to his names and been a part of several public meetings in Uttar Pradesh. All of which drew a heavy crowd. Modi has criticized Akhilesh government overtimes for corruption and lack of development. UP Elections 2017 Results Assembly / Vidhan Sabha. Akhilesh Yadav and Mayawati are again at the front as the chief ministerial candidates from SP and BSP respectively. BJP hasn’t declared one yet. Also, the opinion polls are divided. On one hand, people are of the favor that BJP will win easily while others say that BSP has a very strong base in the state and will dethrone SP with ease. UP Elections 2017 Results Assembly / Vidhan Sabha. The INC was the dominant party since independence and until the late 90s when regional parties like SP and BSP started challenging its political base in the state. 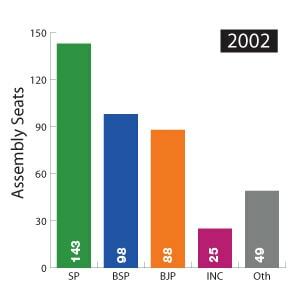 The BSP won with a complete majority in 2007. 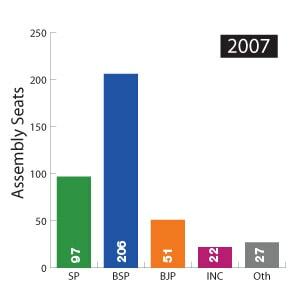 The Congress got only 21 seats in 2009 while BSP got 20 while SP garnered 23 while BJP had to settle for just a total of 10 seats. 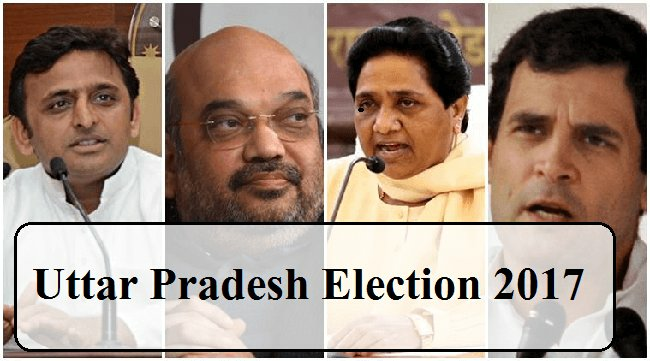 The recent prominent politicians of the state are as follows: Mulayam Singh Yadav (SP), Kanshi Ram (Founder of BSP), Atal Bihari Vajpayee (BJP), Sonia Gandhi (INC), Rahul Gandhi (INC), Murali Manohar Joshi (BJP), and Menka Gandhi (BJP). All of them had been the MPs of the different constituencies from the state. UP Elections 2017 Results Assembly / Vidhan Sabha. The last Vidhan Sabha Poll held in 2012 in seven phases. A total of 222 political parties took part in it. The total number of contestants in that Vidhan Sabha elections were 6839 while there were around 127492836 electors. Out of which only 75725793 went out to vote making 59.40% of total electors. SP won 224 seats and was a complete victorious. Thus, it formed the government with Akhilesh as the Chief Minister. Swami Prasad Maurya became the opposition leader from BSP. Mata Prasad Pandey is the Speaker of the state legislative assembly. UP Elections 2017 Results Assembly / Vidhan Sabha. The Vidhan Parishad permanently houses a total of 100 members. They are elected for a period of six years while one-sixth of them are getting retired every two years. Out of those 100, 10 are nominated by the Governor of the state while the rest of them are elected by various electoral colleges those of Vidhan Sabha members, local bodies, teachers, and graduates. Some of its prominent members are as follows: Parmeshwar Lal (BSP), Jitendra Yadav (BSP), RS Kushwaha (BSP), Akshay Pratap Singh (SP), and Dinesh Pratap Singh (INC). UP Elections 2017 Results Assembly / Vidhan Sabha. Stay tuned for the real time updates and news across the state. Don’t forget to share.